Arijit Singh Birthday Special: 7 ‘Happy’ Songs of the Aashiqui 2 Singer That Make Him More Than the King of Tragic Tracks! Akshay Kumar returns to the big screen with his first film of the year, Kesari. The movie is based on the epic Battle of Saragarhi that took place in 1897. Akshay Kumar is romancing Parineeti Chopra for the first time in this movie, after having worked with her cousin, Priyanka, in films like Andaz, Aitraaz, Waqt - Race Against Time, Mujhse Shaadi Karoge etc. Kesari is directed by Punjabi film-maker Anurag Singh while Karan Johar serves as the producer. Kesari Star Akshay Kumar Wants To See a Chapter on Battle of Saragarhi in History Textbooks. As mentioned above, Akshay Kumar is playing the lead in Kesari. His character is Havaldar Ishar Singh, the leader of the Sikh regiment. Parineeti Chopra is his deceased wife whom he remembers through flashbacks. The movie also stars Mir Sarwar and Vansh Bharadwaj. Kesari is based on the real-life historical Battle of Saragarhi that happened in 1897. As per history, 21 Sikh soldiers from the British Indian regiment fought valiantly to hold the fort of Saragarhi from 10,000 odd Afghani marauders. All of them lost their lives in the battle but they managed to hold off the enemies till the reinforcements arrived. Kesari tells us the story of this valour. Kesari is reportedly made on a budget of Rs 80 crore, which may not include Akshay Kumar's share of profits. As per early estimates, Kesari is expected to earn around Rs 25 crore on its opening day. By the end of its first extended weekend, the movie should cross Rs 100 crore, especially with the positive reviews in. Some of the critics and trade analysts who were able to catch an early screening were in praises of Kesari. They have called Akshay Kumar's direction as his career-best, and Anurag Singh's direction as ambitious. 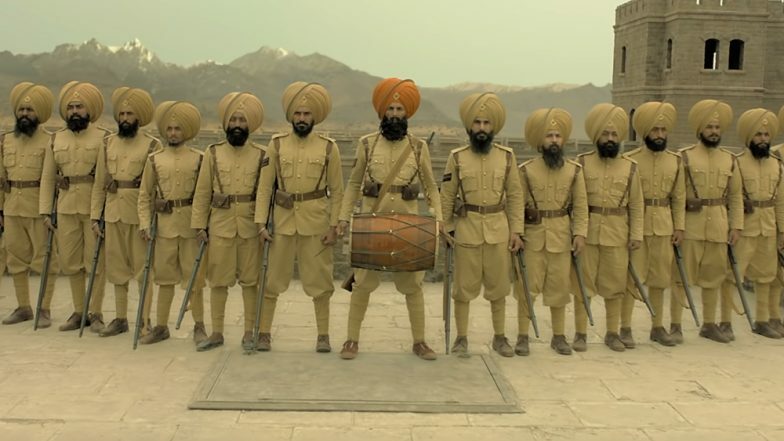 We will put up our exclusive review of Kesari soon, so keep a tab on LatestLY for this.